About Us - Gwydir Water Services - Solar Pumps, Windmills, Bore Pumps, Water Devining and Drilling. Inverell. Gwydir Water Services is an Australian company, owned and operated by Simon Dean and based in the northern New South Wales town of Inverell on the Macintyre River. We are known amongst our long list of satisfied customers for our first class service and reliable workmanship, built to last in Australia’s infamously harsh climate. We work closely with our customers from all sectors; domestic, commercial and agricultural, to create functional, reliable water supply systems. From consultation to completion, we offer our expertise and local knowledge to ensure the best results every time, advising on ideal systems, placement and much more to create the perfect solution for your property and application. 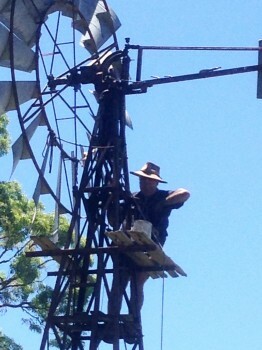 With over 10 years in the industry and as recognised members of the Windmill Contractor Association of New South Wales, when you choose a system or service from Gwydir Water Services you can rest assured that we not only meet industry standards but we also have local knowledge priceless for this industry, while maintaining a large network for parts of most makes and models. We only use the highest quality systems from industry leaders, ensuring systems are built to last.